Coastal communities constitute a growing share of the world’s population, but they face an increased risk of flooding as a result of climate change. This column proposes new measures of the potential damages from coastal flooding, and argues for action based on the idea of ‘acceptable risk’: the maximum amount of damage a society is willing to accept from a flood event. Agreement on what represents acceptable risk should be a participatory process involving all sections of society. According to the new method of assessment, the world’s most at risk cities are Guangzhou Guangdong, New Orleans, Bangkok, Mumbai and Kolkata. What are the true risks of coastal floods and how are they being increased by climate change? Based on a great deal of research, we now know fairly accurately that the distribution of sea level rise is a probability distribution of damages for the different levels of damages. We also know (though less precisely) how this distribution is shifting over time as a consequence of climate change, and that the probability of higher levels of damages is increasing. The question that follows is what should we do about it? Prevention takes many forms: sea walls can be built, and areas subject to frequent damage can be cleared or their use modified. Standard economic tools of analysis compare the average or expected damages at a given point in time against the costs of actions to prevent or reduce these damages. So if the annual average damages are expected to be $100 million and these can be reduced to $20 million through an investment program that has an annualized cost of $50 million, the program is justified. In practice, the calculations are more complex, as protective investments take time and they have to be started in advance of the year that they are needed. Damages are also not constant but increase over time, so the comparisons involve streams of costs and benefits that have to be discounted to make a single comparison. 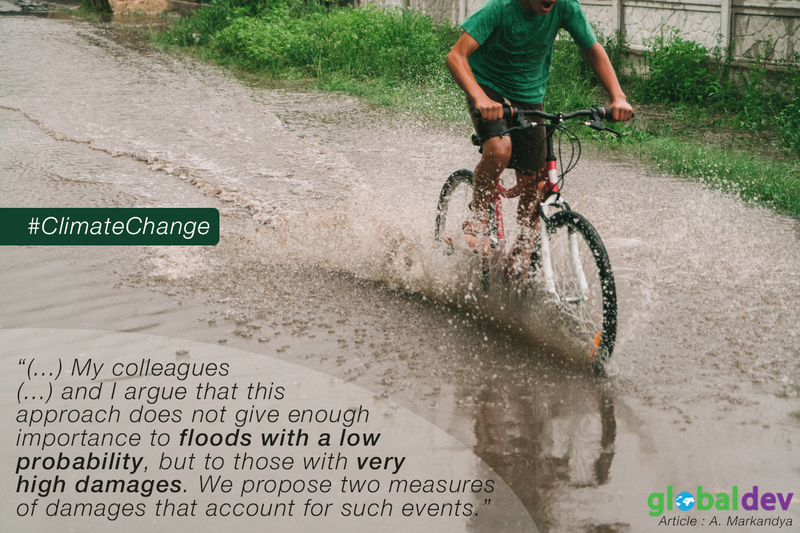 In recent work, my colleagues at the Basque Centre for Climate Change and I argue that this approach does not give enough importance to floods with a low probability, but to those with very high damages. We propose two measures of damages that account for such events: the value at risk – VaR (95%), and the expected shortfall – ES (95%). The first represents the damage at the 95th percentile of the distribution and the second the average damages of the 5% worst cases. Using these measures (which are well known in financial research), the level of damages that are to be compared against the costs turn out to be much higher than if we simply used the average damages. We argue further that these measures of damages can be used to decide on actions that are based not on comparing costs and benefits but on using the idea of acceptable risk. This is defined as the maximum amount of damage a society is willing to accept from a flood event and can usually be calculated as a percentage of the value added of the city or region being affected. Agreement on the acceptable risk is (or should be) a participatory process involving all sections of society. Once agreed, experts can then calculate the minimum investment necessary to ensure that the risk is not exceeded, as well as the dates when the investment has to be in place and when work has to start to build the protective structures or make other changes. We believe that such an approach is superior to one that compares benefits and costs because public perceptions of risk are more easily understood in terms of acceptable loss under uncertainty. Cost-benefit methods do come up with a solution that maximizes net benefits, but that outcome is often disputed and the calculations and distribution of the benefits are argued over and questioned. The approach of getting to a solution that ensures an acceptable level of risk, defined in a way that is well understood, has a better chance of being accepted. Participatory methods of eliciting attitudes to risk are being developed and used in a number of places, including by us in the Basque Country. Such methods give a wide range of stakeholders a chance to express their preferences bearing in mind the costs and benefits of living with different levels of risk. Of course, by itself that is not enough. As acceptable risk is a single good to be shared by society, any selected value will not be everyone’s most preferred choice. But as with any public good, democratic societies should be capable of reaching a consensus. One of our studies reports some calculations of the levels of investment and the time at which they need to be in place for one city – New York. Such data and analysis should be of considerable value in the debate on adaptation across coastal communities, which account for 600 million people and are a growing share of the world’s population. We are now working on similar calculations for several other cities. Among the ones with the most assets at risk using an expected losses criterion, Guangzhou Guangdong in China, Bangkok in Thailand and Kolkata in India rank second, third and fourth respectively on the global scale. The estimated losses using our method of assessment are much higher, but the ranking also changes. So now Guangzhou Guangdong is the world’s most at risk city, and the next four are New Orleans, Bangkok, Mumbai and Kolkata. Given the higher damages, investments in protection need to be greater and they need to be initiated earlier than previously thought. Anil Markandya is currently Distinguished Ikerbasque Professor at the Basque Centre for Climate Change in the Basque Country, Spain and Honorary Professor of Economics at the University of Bath, UK.